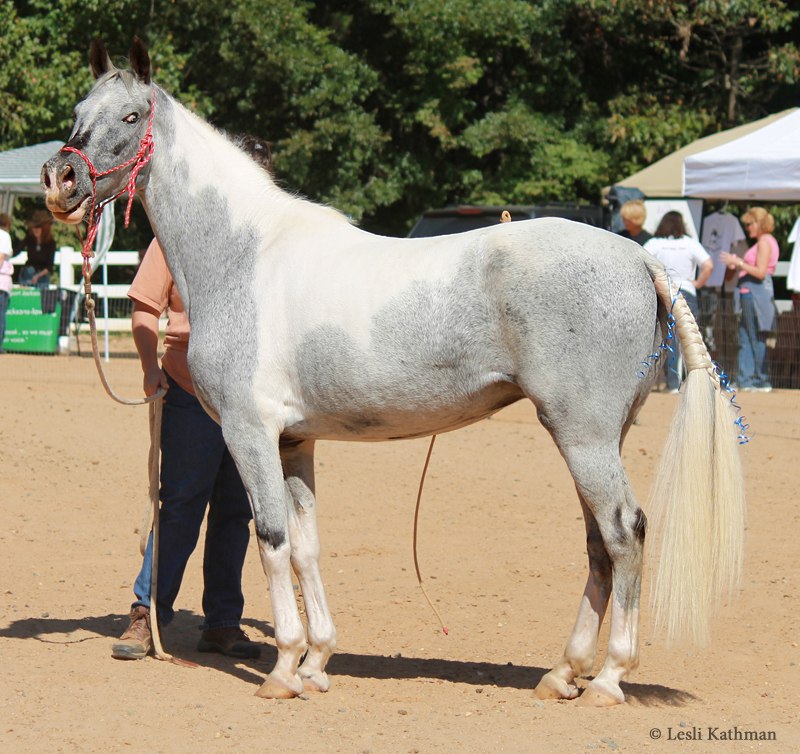 This is “Gump.” He’s a Paint Horse that shows here in the Carolinas, and is the horse that first had me wondering about the possibility of a dark ticking pattern that was separate from any of the white patterning genes. As you can see, he has quite pronounced spotting on his face much like one might expect to see on a leopard. The problem is that were he actually a leopard as well as an overo, those spots would replace his bay areas, not his white areas. (For those just joining the conversation, the two previous posts explain this in much more detail.) I suspect those familiar with leopard patterns would also recognize that there area around his mouth doesn’t look right for the appaloosa pattern, either. It is too “clean”, with the spots and the white very clearly defined. If you cover his face so that just his muzzle shows, he looks like a pinto with “kissy spots” and not a leopard appaloosa. So he is just a pinto. Here is a side shot to show the rest of his pattern. As this picture shows, he’s a frame overo. That white on the side of the neck and again on the side of the body are classic placements for that particular pattern. He probably also has one of the sabino patterns, since he has high stockings in the back. 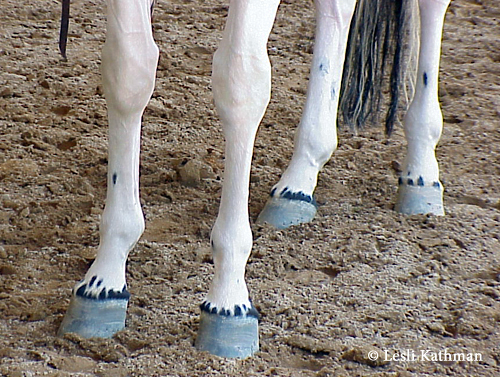 Frame does not typically add white to the legs, so frame horses with white legs are usually carrying something else in addition to frame. Since the various sabino patterns are widespread in riding horses, and especially in stock horses, it’s the most likely cause. What struck me about Gump is that his pattern has a torn, angular look, which is quite different from his extremely round ticks. There is spotting on his leg white, too, though I did not manage to position myself for the best lighting in this photo. Like the spots on his face, these are round even though the rest of his stocking goes up in ragged angles. The character of the ticking and his pattern do not match. That is particularly interesting to me, because most of the pinto patterns interact with one another. They don’t just overlap one pattern on top of the other. The presence of one tends to effect the appearance of the others. 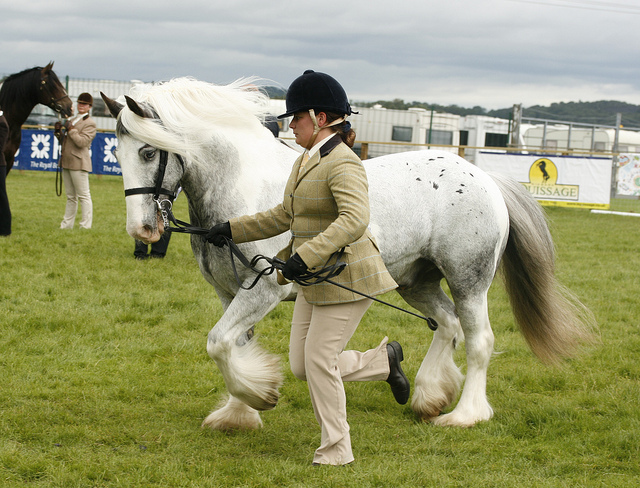 That overall influence gives most patterned horses a harmonious look. It also complicates matters for those of us interested in teasing apart and defining the different patterns, when the action of one mutation changes the actions of a second, unrelated mutation. Sheila Archer, of The Appaloosa Project, refers to this as patterns “talking” to one another. I have always liked that way of phrasing it, and would say that much of what I find most interesting about patterns these days revolves around those “conversations” between the patterns. The discordant patterns on Gump say that whatever is causing his ticking, it doesn’t seem to be “talking” to the rest of his patterning. 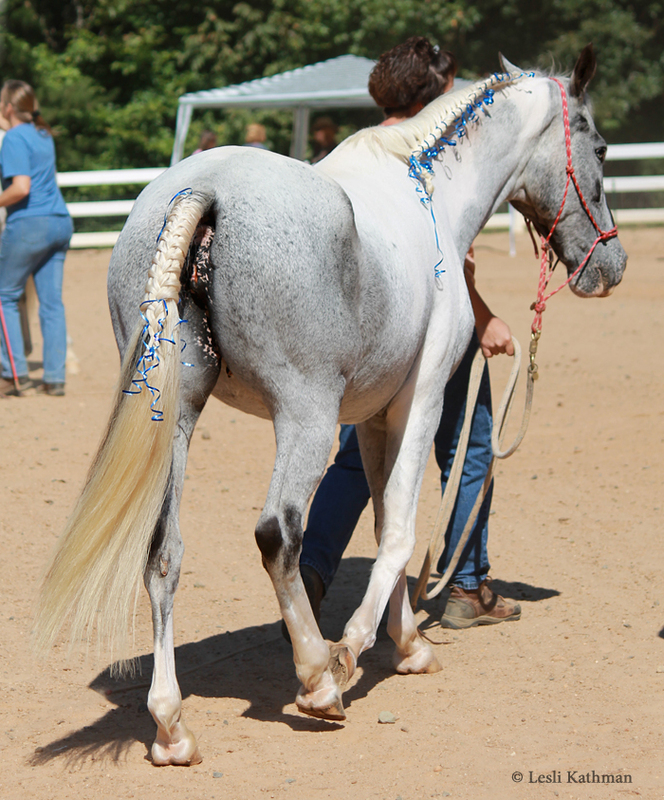 That would at least suggest that it is something separate from whatever is causing his pinto pattern. Gump sat in my “weird stuff” file for years, until last month, when a Facebook friend linked to this horse. When I first saw the image as a thumbnail, I assumed someone had found Gump. The ticking and even her base color is that similar! But that’s not Gump. That’s an Australian sport pony named Haley’s Comet. Around the same time, another horse came to my attention. 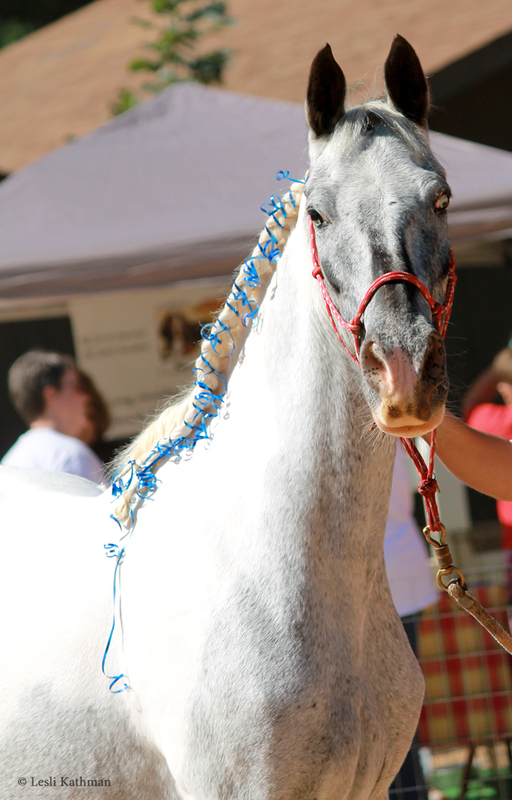 Her image was used on the header of the Paint Horse Connection, a quarterly newsletter that goes out to American Paint Horse Association members, and in an article in the Paint Horse Journal. Like Gump, she is a frame overo, but without the sabino-type leg white. And like Gump, she has the spots that are very concentrated on her face, compared to the spots on her body. Because her body has broad areas of white patterning, it’s even more striking on her. That was what made me think of the Belton pattern in English Setters. They sometimes have that same kind of larger, more concentrated spotting on the face compared to the body. They aren’t all like that. One of the most interesting thing about the ticking (Belton) pattern in dogs is that it does have a lot of variation even within a single breed. But on a horse this kind of concentration on the face is quite unusual. Heavily concentrated dark ticking is odd in horses. Having it more pronounced on the face is stranger still. You might notice that these horses all have a similar spotting arrangement, but that arrangement is rather different from Vision Morinda, the horse posted previously. Her ticking is more uniform, smaller and denser. It is hard to know, with so few horses like this, if these are variations on the same trait, or different things entirely. But having seen a handful of horses like this now, I know I’ll be looking at ticking more closely in the future. 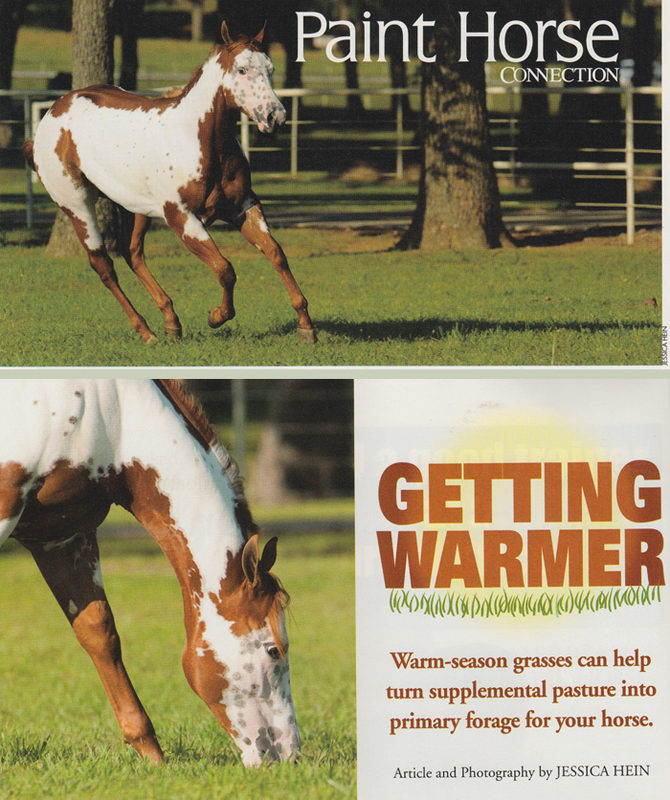 And certainly if any readers find horses with interesting spots inside markings or patterns that don’t fit what might be expected for a tobiano or one of the overos, please pass them along! 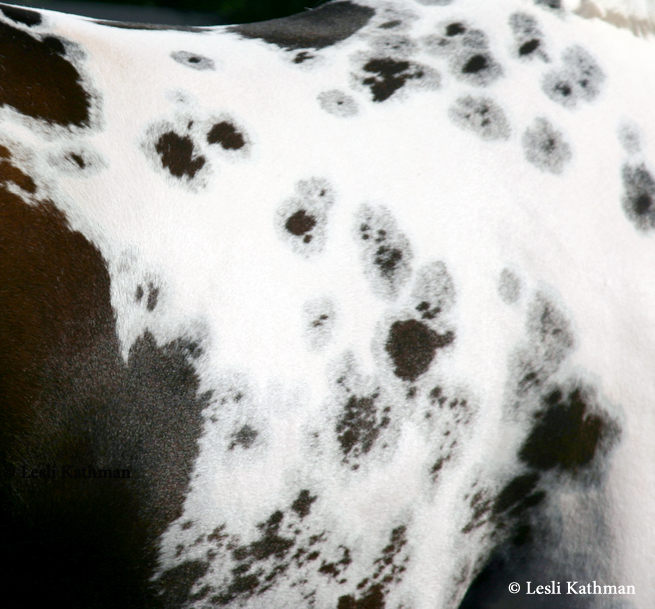 In the previous post, I talked about the two things that cause horses to have small dark spots on a white background. The first was the leopard pattern (Leopard Complex + Pattern1) and the second was the homozygous tobiano pattern. In this post, I want to talk about how dark spots on a white background are different in dogs. Dalmatian dogs look like leopard appaloosas. It’s the same white background and the same small, round spots of color. But Dalmatians are genetically very different from leopards. In fact, they have a lot more in common with the homozygous tobianos. That’s because they are “pinto” dogs. They just happen to be missing (or at least mostly missing) their dark patches. In fact, if you can imagine someone starting out with a classic tobiano horse – dark head, large round areas of color on the body – you have a good idea of what the basic piebald pattern is in dogs. In fact, in some countries the name for tobiano and the name for this pattern in dogs is the same: plating. Plattenscheck, platenbont – plate pinto. It makes sense, since tobianos have large “plates” of color on a white background. These dogs do, too. Or at least they started out that way. 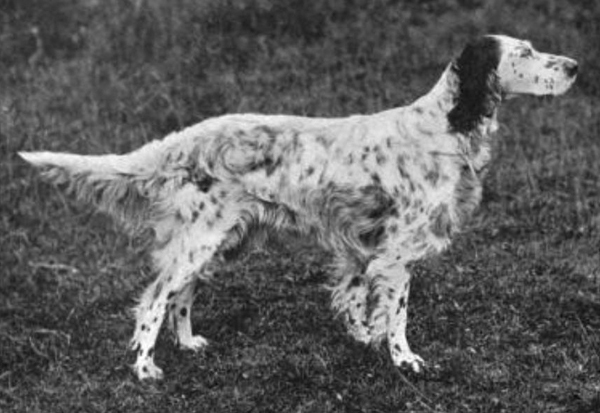 Here is a popular sire of English Setters from a little over a century ago. 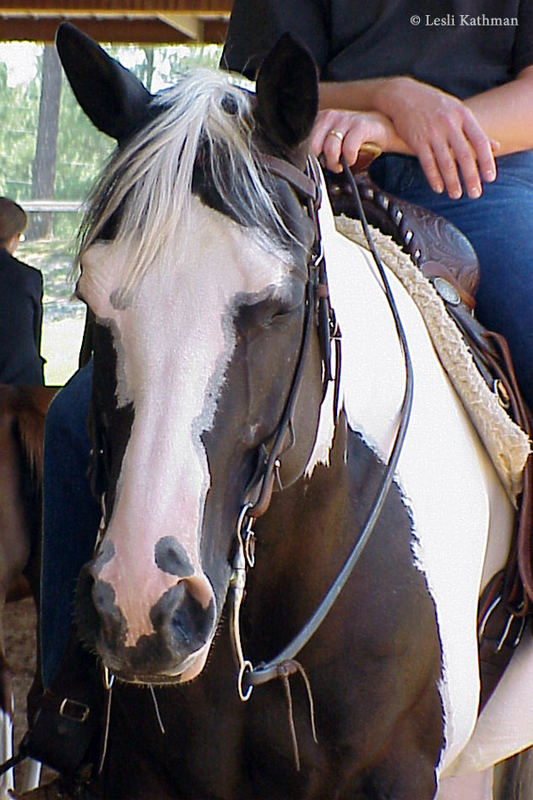 His pattern is very reminiscent of tobiano. But breeders did not care for the patches, so they began breeding away from them. In dogs, this kind of pattern is often called “extreme piebald”. It is still a “pinto” dog, but it doesn’t have a lot of color left, even on the face. 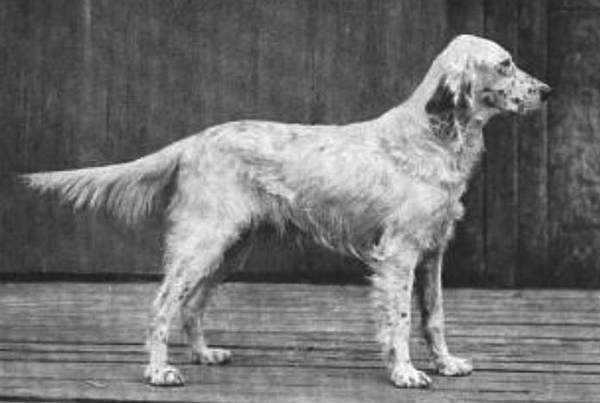 English Setter breeders were not alone in this preference. The Dalmatian breeders were selecting for the same thing. They did not want patches, or even dark ears. They wanted all-over round spots. Those round spots, which are visible in all three of these English Setters, look a lot like cat tracks to someone familiar with tobiano. What makes them different is that they aren’t actually part of the plating pattern. They are a separate thing entirely. 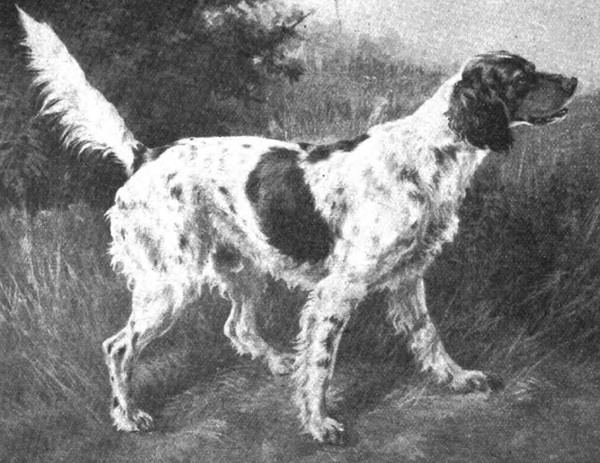 For English Setters and some of the other sporting breeds, that’s the “Belton” pattern. The more technical names for it – ticking and roaning – are unfortunately for us horse people, already taken by very different patterns. So for now we’ll just use Belton to avoid making this any more confusing. 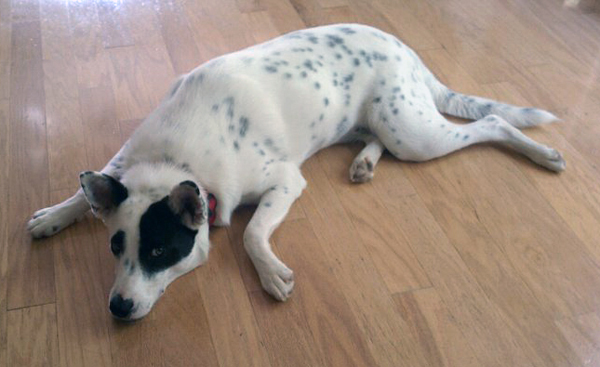 Belton adds dark spots of color to the areas the piebald pattern leaves white. 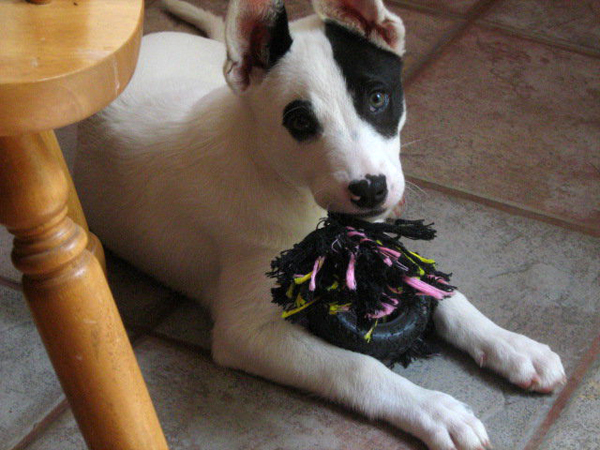 What dog breeders have done is manipulate the scale and spacing of those spots of color. All three dogs at the top of this post have what are believed to be variations on this kind of patterning. The English Setter to the left is of course the original Belton pattern. 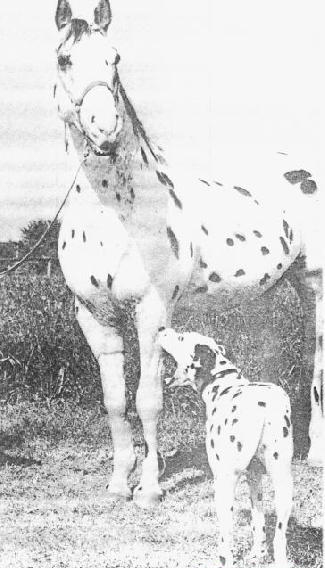 The Dalmatian in the middle is likewise has a Belton-type pattern, but he also has some kind of modifier that has made the spots larger, rounder and more distinct. 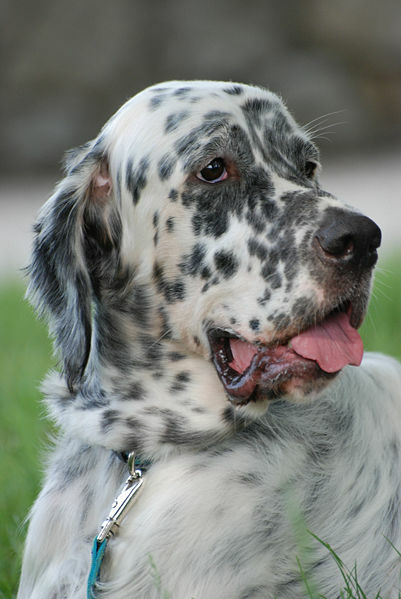 (Some of the distinctive nature of his spots are, of course, because he is a sleek-coated dog compared to the setter.) The Australian Cattle Dog at the end has a Belton-type pattern that was modified to the other end of the spectrum, with spots that have gotten smaller, less round and less distinct. 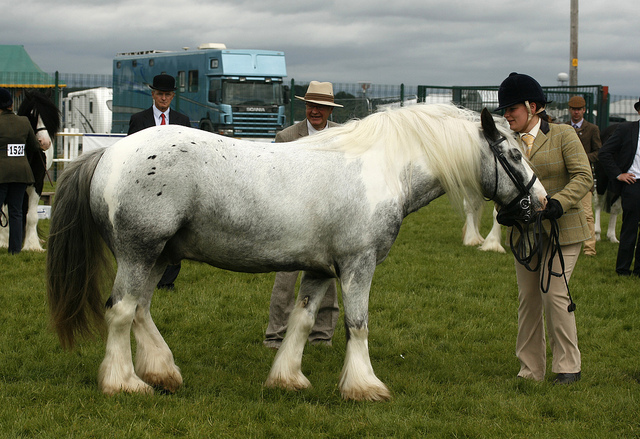 In some breeds, this is what is called Roan. There is some debate about whether Roan and Ticking in dogs are truly separate, or just variations on the same gene. 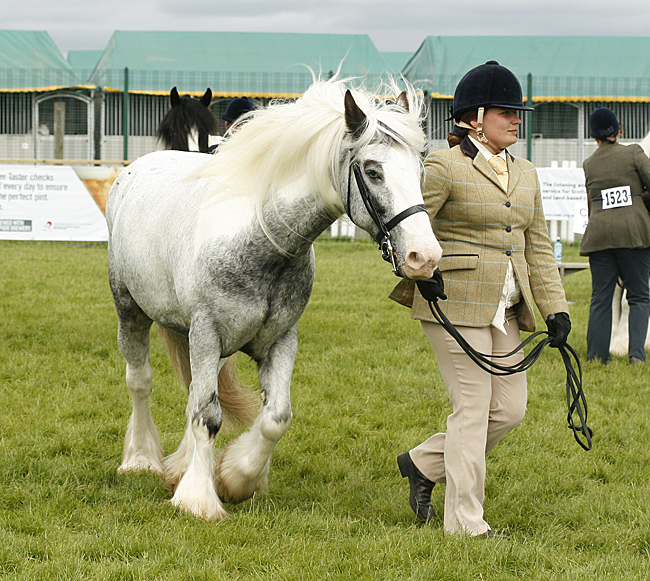 I am not aware of any papers yet published with molecular studies, but it does seem that roan dogs, when outcrossed to non-roan breeds, end up with offspring that look a lot like the Belton setters. Certainly whether these are separate, similar genes or the same gene with layers of modifiers, the end result is that dogs have independent factors that will “recolor” the area that a piebald gene left white. It didn’t seem that horses had that, at least not until recently. In 2009 a French sport horse, Vision Morinda was foaled. Clicking on the image above will take you to the website for her breeder, and her page which has many high-quality photos of her at all ages. As you can see, he looks like a white dog with black patches. He is an extreme piebald. That’s why he has white ears. Well, mostly white ears. He was already starting to show some spotting there. His back and sides, however, looked white. But here is Volt today, as a grown dog. As you can see, he developed his ticking – the Belton-type pattern – over time. In a less dramatic fashion, Vision Morinda seems to have spotting that intensified as she matured. (Her breeders even comment on her page about the surprise of getting an English Setter color on their horse.) The spotting on her is also different, visually, from a typical tobiano with cat tracks. The pattern is evenly distributed. The spacing does change somewhat (notably across her shoulder) but it still is pretty consistent across the white areas, rather than clustering into spots or patches. It looks like the ticking you would see on a dog, not a horse. This raises the question of whether there is some factor in horses that can add ticking – a Belton pattern, so to speak. I have a few more horses to share, all with odd spotting patterns. None are quite like Vision, but all have unexplained dark spots inside white patterns or markings. They all come from my “weird stuff” files. That’s where I put things that don’t make sense, or just seem “off” in some fashion. Sometimes enough of them accumulate – like the odd late greys from a few months ago – that it seems like there might be some thread connecting them all. I am not sure these horses really have a common thread, because they do have some visual differences, but I’m going to start posting them just to see if more turn up. That’s what happened with those greys (I have more that I need to post in the future, by the way!) so maybe sharing them will bring others out of the woodwork! Images of leopard appaloosas with Dalmatian dogs are always eye-catching. Certainly they can look quite closely matched, like this Polish Malopolski and his buddy. Even so, the patterns in the two species are very different in terms of what is really happening to the pigment on the animal. That’s probably off in the weeds for most owners and breeders, but for artists the distinction is actually pretty important. This touches on one of the reasons why artists who develop an interest in horse color often have such a different perspective. Usually the kind of information a breeder needs is predictive. That is, they need to know what might likely result from crossing this to that, or what they might need to cross if this particular end result is what was wanted. What artists need to know isn’t about prediction nearly so much as it is about possibilities. Not so much what might happen, but what could happen – even far-out-there, not-very-likely, could happen. That’s because artists often want to add something for interest or for composition. For those producing realistic art, that has to be done within the constraints of what is possible. It doesn’t necessarily have to be likely, but it does have to be possible. This unique perspective became apparent to me a number of years ago when I gave my first presentation on horse color. In the question and answer period afterwards, someone in the audience asked if a horse could be both dappled and fleabitten at the same time. It was clear that was not the sort of question my fellow presenter, Dr. Sponenberg, often heard. But it is precisely the kind of question that equine artists ask all the time. 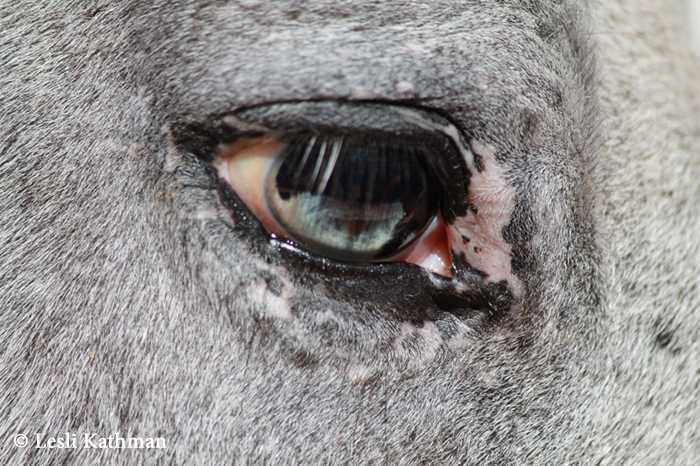 Scientists might not notice this kind of detail on an individual horse, but for someone who paints horses, this kind of information – does this happen with this? – has a lot of practical value. 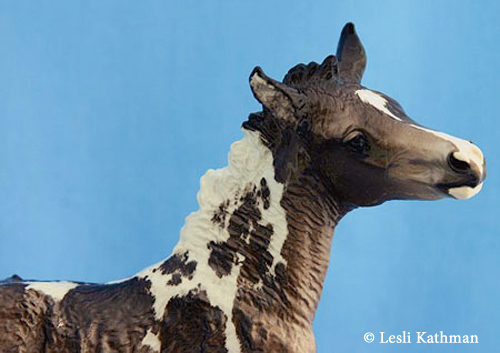 “Trouble”, sculpted by Sarah Minkiewicz-Breunig and glazed by Lesli Kathman. In the collection of Melissa Gaulding. This is a ceramic collectible with the kind of spotting (often called cat tracking) seen in homozygous tobianos. It’s a really popular effect. In my normal job (the one I have when I am not trying to get a horse color book to press), I have produced quite a number of these. The problem comes when this gets confused with leopard spotting, and most especially what happens when leopard patterns are combined with the tobiano pattern. That brings us back to the image at the beginning of the post. These three images – the leopard, the Dalmatian, and my ceramic foal – represent three very different scenarios in terms of the underlying process. I want to take each, one at a time, and explain how they are different despite looking so similar. This is the typical nose-to-toes kind of leopard. Most people would think of this as a white horse with black spots that have been superimposed on top. That’s not really accurate. From a genetic standpoint, this kind of horse is a two-step process. First she has inherited a gene that progressively adds white hairs to the coat. Those hairs, over time, are going to produce the fairly distinctive pattern known as varnish roan. If the pony in my illustration just had that first gene, she would look like a black version of this pony. That first gene, known as Leopard Complex, sets things up for leopard but it doesn’t make leopard patterns itself. That happens when the horse inherits a separate patterning gene in addition to Leopard Complex. In this case, that patterning gene is called Pattern1. What Pattern1 does is take the white from Leopard Complex and amplifies and organizes it. So while our horse looks like she is white with spots, it is perhaps more helpful to think of her as a horse that was roan, but Pattern1 has now taken that mixture of white and dark hair and reorganized it. Underneath the white hair, what that horse may look like is closer to this. 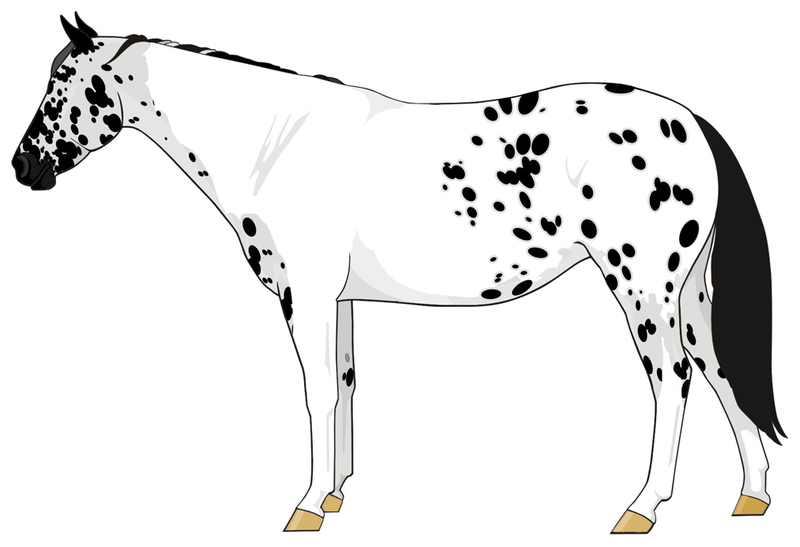 The true white areas of the tobiano pattern cover over the appaloosa pattern. 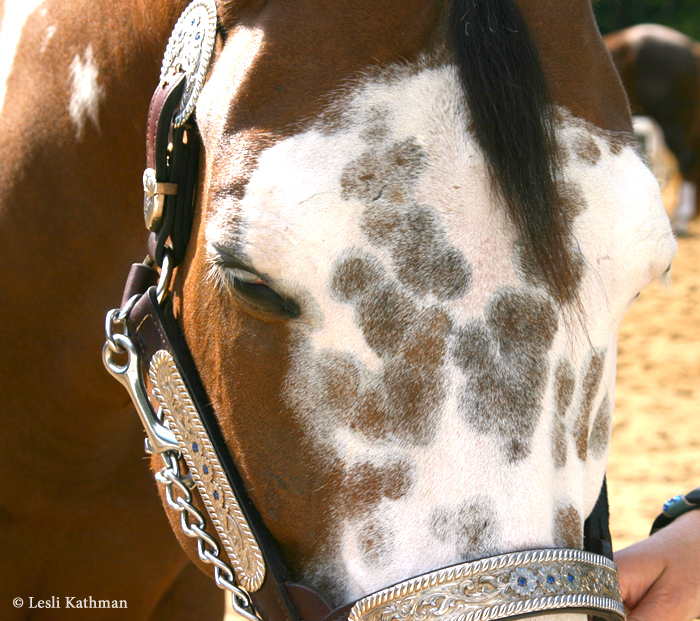 The spots from the leopard pattern don’t spread over onto the tobiano pattern because the process with Pattern1 isn’t “add dark spots to the white”, it is “organize the roan into spots.” So the spots don’t happen where the tobiano pattern already took all the roan away. Without the color there in the first place, Pattern1 has nothing to work with. Of course, if we moved our tobiano pattern out a bit, encompassing more of the dark skin and butting it up close to the “blanket” skin, we could probably get something that looked a bit like the leopard spots migrated over some of the tobiano. Even so, the spotting is still concentrated in such a way that shows it is an appaloosa pattern with a tobiano pattern layered over the top of it. 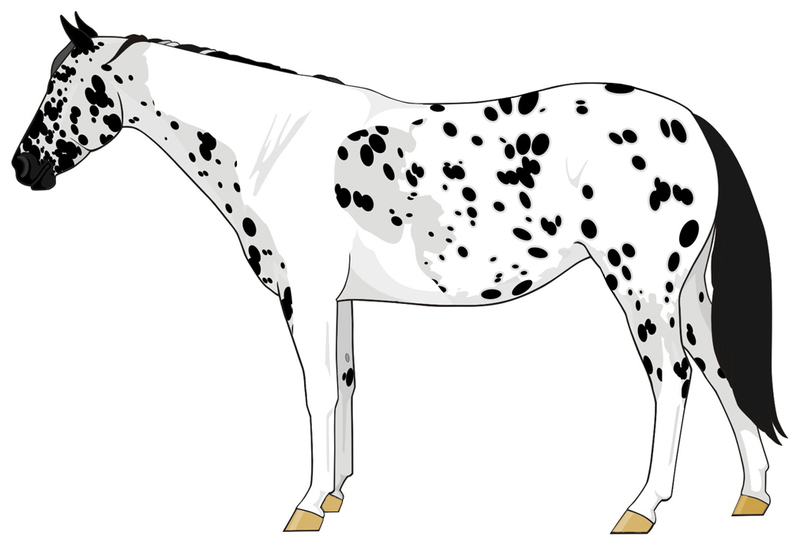 The spots on the flanks might look like they are in the tobiano white, but really they are just in an area that was already white from the action of the Pattern1 gene. The action is still the same. The tobiano is there adding true, pink-skinned white on the horse, and underneath it Leopard Complex and Pattern1 are just doing their thing. Even with the tobiano bumping up to the pink-skinned areas of the leopard pattern, it still looks different from the kind of spotting that comes from a horse having two copies of the tobiano gene. 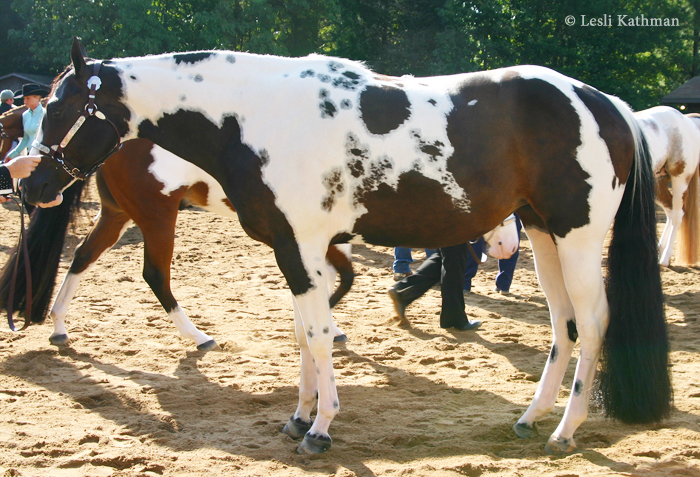 This is a (presumably) homozygous tobiano with cat tracks. 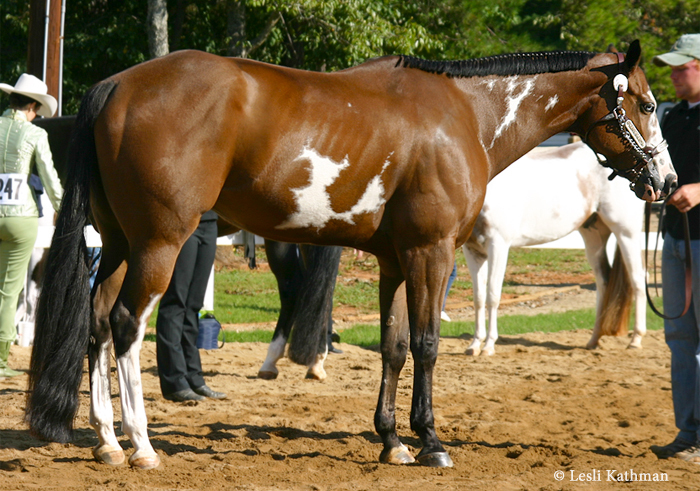 Whereas Leopard Complex is a roaning process that Pattern1 takes and organizes into the leopard pattern, this type of spotting is more like a not-entirely-successful attempt to add some more color to a horse that already has large patches of color. Unlike the existing spots, which are large and opaque, these new spots are small and vary in opacity. Some just come through in specks. Cat tracking tends to cluster around the existing spots to some extent, almost as if these new spots want to occupy the same general area as the existing spots. This is quite different from the spotting on a leopard, which tends to be dispersed across the body. The exception is the hooves. 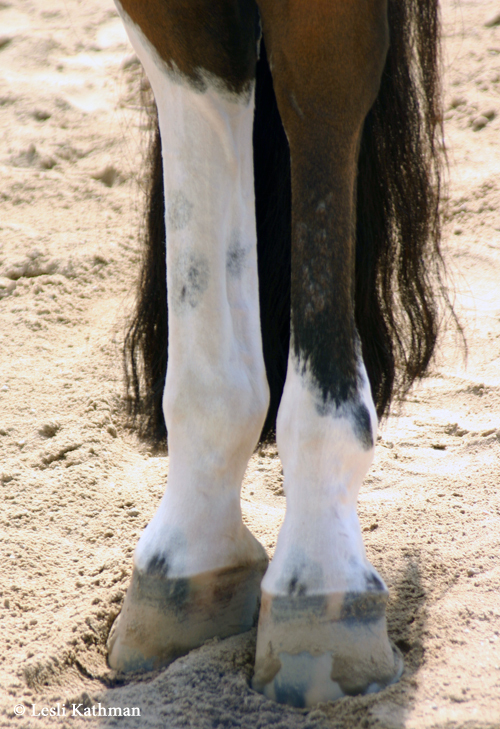 Tobianos with cat tracks often have a concentration of spots around the coronary band, often turning the hoof completely dark or nearly so. There are spots on the legs, but typically they are not as numerous as the ones around the feet. The same is true for the face. This is the face that goes with these feet. He does have a few spots in his blaze, but they are not extensive. So how is this different from the Dalmatian? Well he really is a white animal with colored spots added on top. In dogs, the gene for this is usually called Ticking, but since ticking means something different in horses, I am going to use the older English term for the pattern, which is belton. This post has run really long, so I’ll split that over into a second part. And why delve into the belton pattern in dogs? Because lately there has been a handful of horses that have turned up that just might have that kind of spotting. 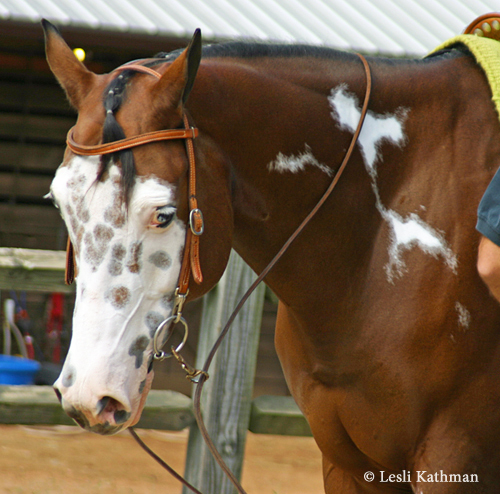 At the very least there are horses with dark spots inside their white markings that are not tobiano cat tracking and not leopard patterning. More on those will appear in the next post! 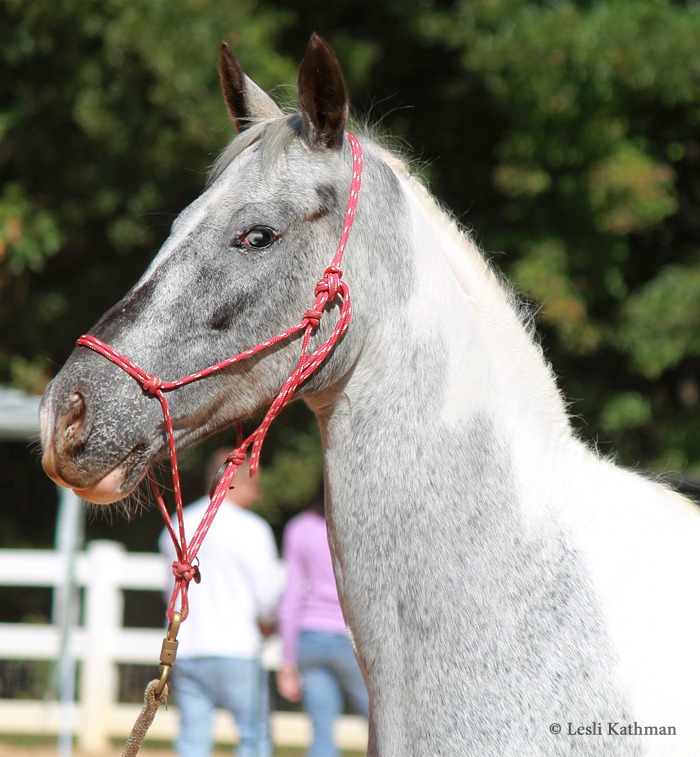 It can be really hard to get good shots of horse eyes, so I was really pleased to get a number of good shots of this Pintaloosa mare and her partially blue eyes. The placement of the blue segments certainly give her an unusual expression. This first image shows how her left eye has a blue section towards the upper front of her eye. The apparent shape is accurate – none of the bluish area is glare – since it is consistent across a number of images. Here she is looking forward with her mismatched eyes, one with a blue bottom and one with a blue top. Here are some full-body shots of her, showing her varnish roan (leopard complex) and tobiano patterns. The varnish mark on the top of her tear bone is particularly noticeable in the first picture, and the mark across the nasal bones in the second one.